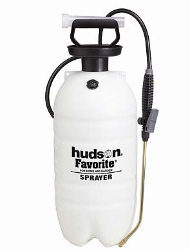 2.5 gal Hudson Favorite Value-Priced Compression Sprayer with brass wand. . Translucent poly tank with large funnel top. Poly TOV™ thumb-operated valve. 12" curved brass extension wand. Brass cone nozzle. Locking pressure release valve. Comfortable "d-shaped" pump handle. On-board measuring cup. Supply tube filter. 1-year manufacturer warranty.